"Remember there's no such thing as a small act of kindness. Sometimes everything happens perfectly together. This time of year 2018 plans are ending and planning for 2019 begins. After meeting with my Rising Tide Society, Tuesday’s Together group last week - we discussed Philanthropy. Philanthropy is defined by good ole Webster as “goodwill to fellow members of the human race.” So, I wanted to make my goal for 2019 to be better at giving back to my community. But, how? How could I give something of myself, as well as use my photography. Then I received a message from Ken Cole to help photograph one of his HUMANEKIND Project events - and I had found it. 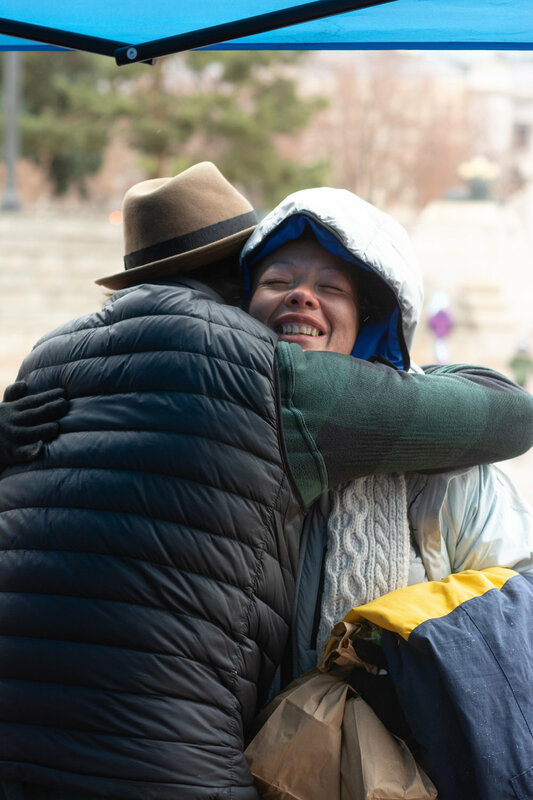 Every Saturday morning, they volunteer to help the homeless at Civic Center Park in downtown Denver. He calls them block parties, and makes them feel that way with food, community and music! This past Saturday was their biggest event of the year. It is where they try to make sure the homeless have what they need for the winter - coats, blankets, hats, gloves, etc. The event doesn’t feel like a line at a soup kitchen - it feels like a party, a good place to be. Everyone is helping, smiling, dancing and laughing together. It was an awesome experience, and I am a better human for having been there. This guy stayed the entire time and looked through every piece of clothing. He just wanted to find what he needed. The gentleman above was the first person in line for the Block Party. After grabbing his food, the first thing he wanted was a haircut from Jake at The Bearded Rooster. 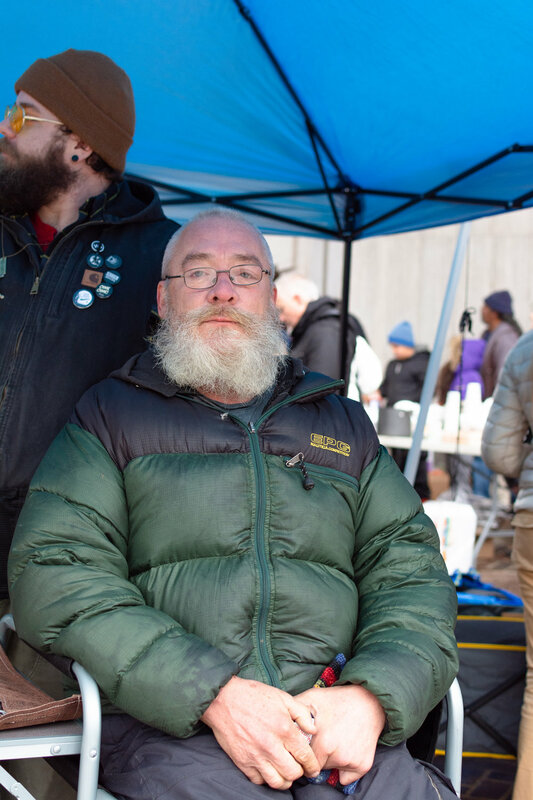 Once a month, Jake comes to the block party with a wagon full of supplies, razors, shears, a smock and a chair. He chats with them, listens to them, and treats them like everyone else who sits in his chair. I asked the gentleman if I could take his photo when he sat down in the chair; but he asked me if I would like an “after” photo. That haircut made him feel good, made him feel more confident and allowed him to feel better walking away. 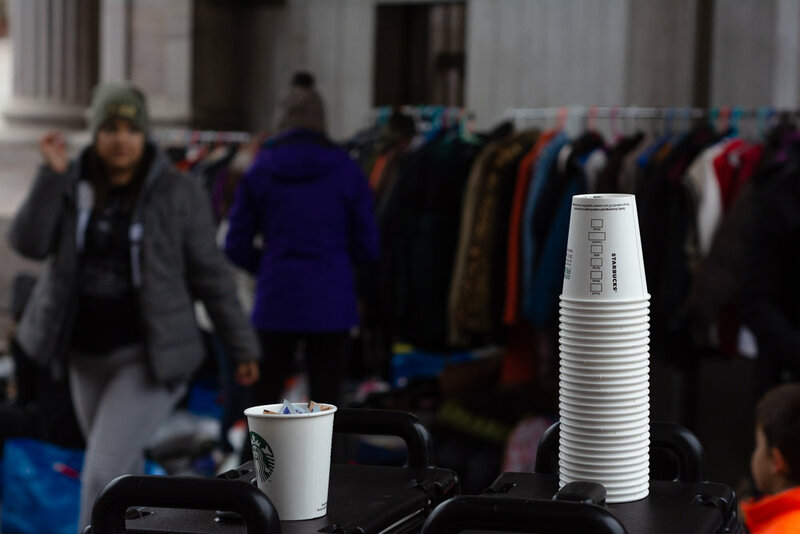 Starbuck’s provides coffee every Saturday and Just Say Hello, Facing Homelessness Denver provides food and other resources. The photos above are the faces of the homeless in Denver. White/Black/Hispanic. Male/Female. Young/Old. Homelessness does not discriminate. The man above is deaf. I asked if I could take his photo, and then thanked him in sign language. The volunteers make it all happen. It was FREEZING this past Saturday, but they all arrived with a smile on their face. Anyone can volunteer, any Saturday - just show up and give your time. Help provide a meal or some conversation - you will be a better human because of it. 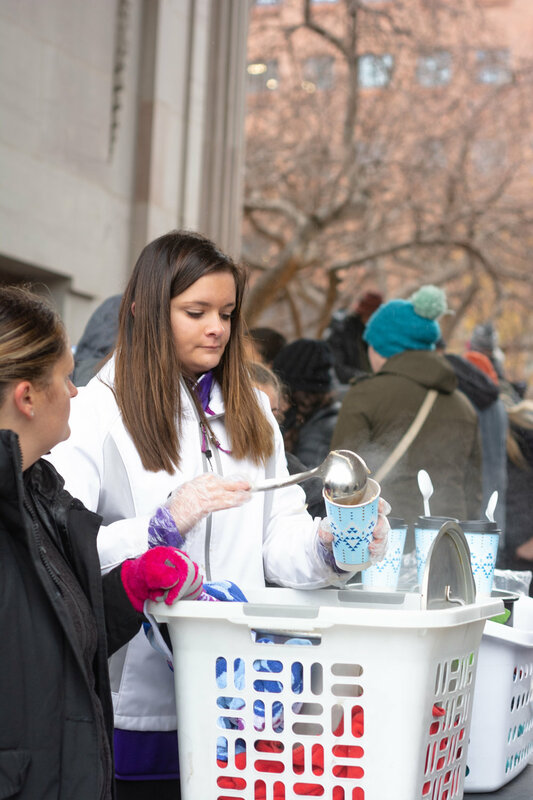 One of the volunteers told them “the soup was made with love.” I’m sure they don’t hear that word very often anymore - love, but remember they are still deserving. And every Saturday, Ken is there. He continues to make sure the homeless are getting what they need. He hugs them, listens to them, looks them in the eye, knows their names and why they are homeless. They trust him. He is a good human. I was only able to donate a few items, but Ken told me a little bit about what they need. He said used/old items are better. Something new will either make them a target to be stolen from or they may sell it for the money. It is just the way the homeless culture works. These guys want to help also! They have a truck that is loaded with washers and dryers, so the homeless can clean their clothes. They also have another truck with showers. 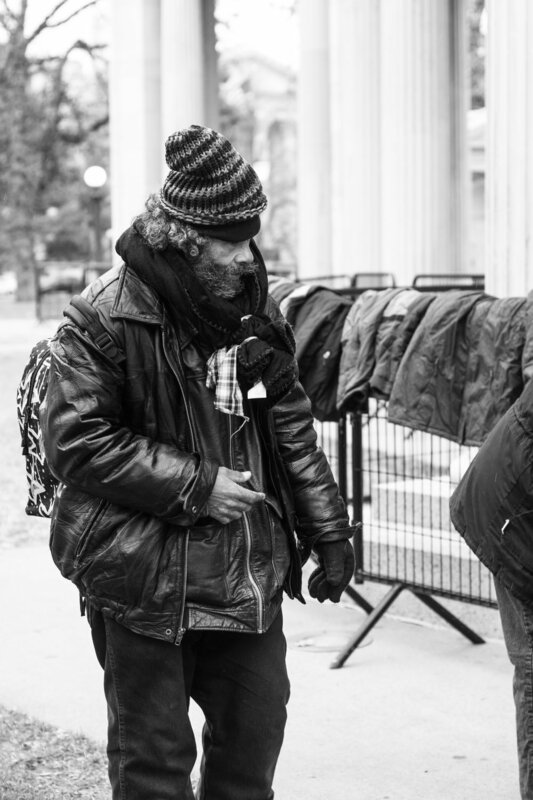 The homeless can wash their clothes and take a shower - something we take for granted. 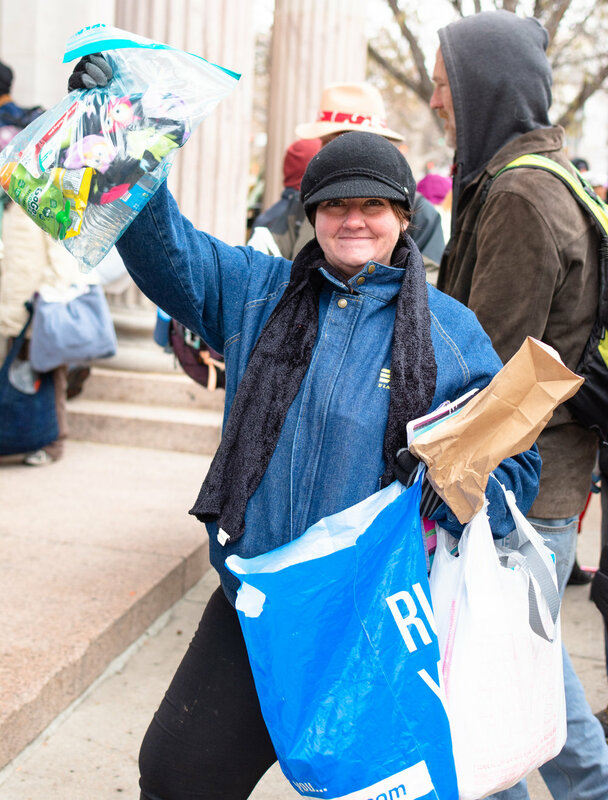 At the end of a Saturday in Civic Center Park, the homeless can leave with a full belly, a new piece of clothing, toiletries, a haircut, and having been treated with respect. They can leave having been treated like a human.